USERS of the Melksham Lunch Club at the Assembly Hall have expressed their shock and disappointment following the news that the long-standing service is to close this month. Wiltshire Council has said that the service is closing because it is not financially viable and is running at a loss of £82,000 a year. 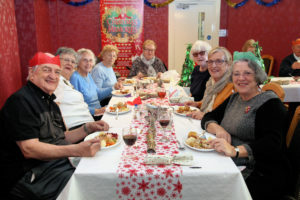 The lunch club, which was first based at Melksham House for many years before moving to the Assembly Hall nearly five years ago, was intended to move to the new campus once it had been built, but now the club will serve its last meal on Thursday 20th December. The news has caused upset amongst the many people who use the club regularly for hot meals and a chance to meet up with others in the community. Melksham News visited the lunch club last week to hear what they had to say. Local woman, Ruby Catt, who has been using the service since its days at Melksham House, added, “It seems like they are putting more people into the town and taking services away. This is a community service that keeps people together. It’s somewhere to go in the daytime – elderly people don’t like going out at night, especially in the winter. The service should be replaced, they have built the new stadium for rugby and football, but what is there for everyone else, for families? Visiting the lunch club with Ruby was her son Frank and his wife Jackie. They said, “It strikes us as the council pulling out more services in Melksham – Christie Miller has just closed. The council has reneged on the agreement with Avon when they promised to continue the service when they bought Melksham House. Wharf Court resident, Barbara Cramer said, “We are all very upset! We did put in a petition to Wiltshire Council to stop the closure, but they are going ahead any way. I come here twice a week and on Sundays with my husband – we’ve been using the service for a long time, since it was at Melksham House. A Wiltshire Council spokesperson said, “It is unfortunate that this service is not financially viable, despite looking at how costs could be reduced and income increased. It is currently running at a loss of more than £82,000 and each lunch provided is subsidised at a cost of £14.25 to the taxpayer. “The council has to focus its budget on the provision of frontline services and therefore has taken the difficult decision to stop the provision of the lunches. “We continue to look at alternative options to support those who currently use the lunch club and benefit from this social gathering. I don’t know how much the participants pay to a member of the club – but it seems that a £14.25 subsidy seems a lot per meal when you can go to a wetherspoons and eat a reasonable (non-OAP) meal for considerably less! I know the hire costs of the hall are minimal so I wonder where the costs are.